This limited ownership Porsche is in excellent running and driving condition, with working A/C. A very original unmolested car that has been well maintained, with its stickers all in the original placement, and is a desirable model. It has good body fit, is rust free, and is equipped with several options such as an electric sunroof, power windows, door locks, and seats. The entire clutch system was replaced along with the brakes at 106K miles, and have less than 2k miles of wear. At that time, a full review was done of the car, and all fluids were changed. The tires have less the 6k miles wear on them with plenty of life left. All receipts will accompany the purchase (going back as far as 1991) as well as the shop/owner manual with service stamps from new. All tools are present except 1 wrench from rear kit, and the dash is 100% original. This Porsche is surely one to become a favorite for weekend drives or as your daily driver. The Porsche 928 was a luxury sports-GT car that was sold by Porsche AG of Germany from 1978 to 1995. Originally intended to replace the company's iconic 911, the 928 combined the power, poise, and handling of a sports car with the refinement, comfort, and equipment of a luxury sedan. 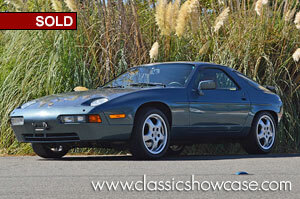 The 928 featured a large, front-mounted and water-cooled V8 engine driving the rear wheels. The 928 was regarded as the more relaxing car to drive at the time. It came with either a five-speed dog leg manual transmission, or a Mercedes-Benz-derived automatic transmission. The body, styled by Wolfgang Möbius under guidance of Anatole Lapine, was mainly galvanized steel, but the doors, front fenders, and hood were aluminum in order to make the car more lightweight. It had a substantial luggage area accessed via a large hatchback. The new polyurethane elastic bumpers were integrated into the nose and tail and covered in body-colored plastic; an unusual feature for the time that aided the car visually and reduced its drag. A Club Sport variant which was up to 100 kg (220 lb) lighter became available to continental Europe and U.S. in 1988.